Unless you only hike in dry climates, such as the American southwest, waterproof hiking boots are needed for your hiking safety. Without investing the cash in waterproof boots or the time to waterproof your boots, you risk your feet getting soaked as you hike, which can lead to blisters, athlete’s foot, and other problems that may ruin your vacation. 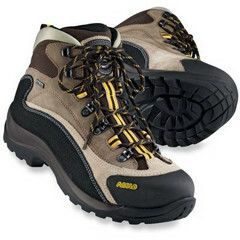 I’ve owned these waterproof, Asolo boots for over 5 years! . They are the only boots I would ever recommend. And yes, they are the same pair. 5 years, no blisters, still function flawlessly. After hiking 500 miles through Spain, a few hundred miles in Glacier, and 1,000s of miles in Colorado, I have never received a blister nor been disappointed in their waterproofness. I swear, you will love these hiking boots. Check them out. 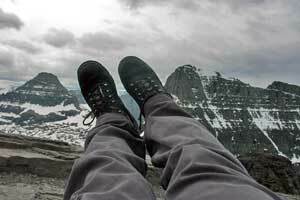 When considering purchasing the best hiking boots for your needs, you need to drop all preconceptions. No longer are bulky, leather hiking boots necessary; nor do you need boots that will make you look fashionable on the trail–remember, choose hiking gear for safety, not fashion. Wherever you plan to hike will dictate the kind of waterproof hiking boots you need. For those hiking in warm, dry climates, the need for your hiking boots to repel all water is not necessary. If you decided to purchase a Gore-Tex lined hiking boot, which I recommend, this section is not for you. For those who opted for a leather hiking boot, you have three options to waterproof your hiking boots. Wax Based – This is one of the best methods for waterproofing your boots. However, you need to apply the wax often to ensure it is fully functional. Unfortunately, wax will restrict airflow and limit your boot’s breathability. Consequently, if your feet do get wet by falling into a river, it will take a great amount of time for them to dry and you may waste additional socks in the process. Silicone – I don’t recommend silicone based products for hiking in the Rocky Mountains as cold weather will cause the silicone to crack and can ruin your boots. Even in the summer, the Rocky Mountain weather can get frigid during evening hours. Oil – A highly successful waterproofing method. However a drawback is that it can lessen your boots longevity. The bottom line is this: If you plan to hike anywhere in America outside of the Southwest, you will be investing a decent sum of money in hiking boots. Instead of buying discounted, inadequate hiking boots, spend the extra hundred dollars for a Gore-Tex lined boot. The breathability and comfort is worth the extra price alone. If you are still hesitant, consider this: buying a pair of cheaper, non-Gore-Tex lined boots probably won’t meet your needs and you will end up investing even more money in new boots shortly thereafter. Again, these are the only waterproof hiking boots I would ever recommend. While pricey, they are well worth the investment. Your feet will thank you later. * Much (much) better breathe-ability then a “breathable’ membrane during dry conditions. Boot dries much (much) faster after wetting when wp sock is removed. * Boot weighs less on foot as wp sock is in back pack and is not a dynamic weight. * Many complain of boot waterproofing starting to fail…which means it failed, as there is only 100% wp. If wp sock fails can buy another without replacing the boot. * Further the boot is only wp to say the top of laces (~4″), whereas the sock can go 8” deep in river crossing. * Cost of boot plus wp sock (~$25) is less than wp boot. I have no issue with Asolo, just the all-in-one wp boot as the best option, it isn’t.